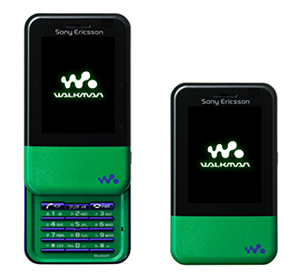 KDDI has introduced their Walkman Phone, the Xmini produced by Sony Ericsson, ready for a late December debut. This extremely small handset (w44mm x h75mm x t18mm) naturally packs full music functionality, including maximum storage capacity of 4GB, capable of holding around 2,300 full-song tracks and incorporates a touch sensor for control even when the device is closed. Apparently the super-thin model, tipping the scales at only 75g, does not have an on-board camera or 1Seg digital-tv tuner, or even external memory slot for that matter, but thankfully it will be available in several colors; Green & blue, purple & pink, white & Tarcoiz and good old black on black. Also noted, the Xmini model ships compatible with the ‘EZ Chaku Uta Full Plus’ service, which is also expected to come online in the latter part of December, making it possible to download and play-back AAC 320kbps tracks ‘for customers who want to be able to enjoy high quality audio content’. Maybe this unit will be popular with the school kids who could try to pass it off as a music player, instead of the soon-to-be banned (?!?) mobile phone, when their teachers come snooping around!